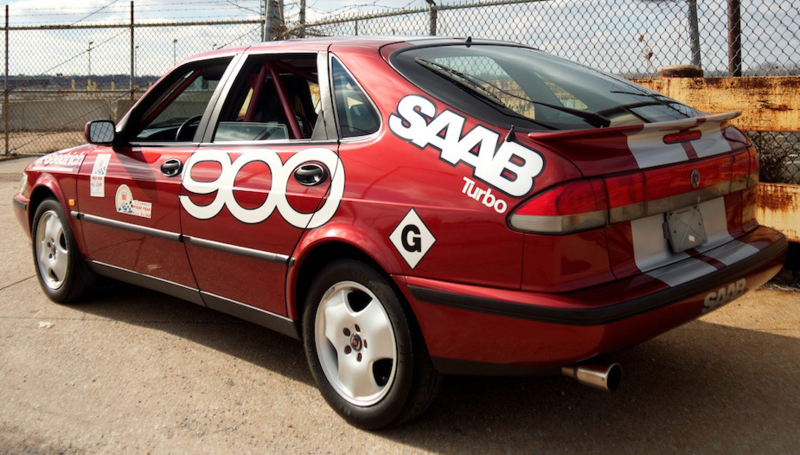 After a rich career that lasted a quarter-century, it was clear that the brand-defining Saab 99-900 series deserved a worthy successor. The Swedish company had started design and engineering development during the mid-1980s, but found itself in financial trouble as a weakening dollar quickly deteriorated its business in the all-important U.S. market. 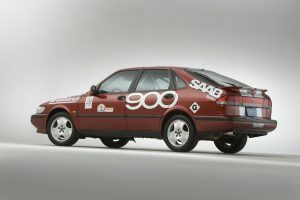 By the end of 1989, General Motors Corp. emerged as the white knight for Saab, initially taking a 50-percent interest in the car company. Beyond financial support, GM Europe was also instrumental in providing technical components and systems that led to the completion and launch of the “New Generation” (NG) 900. It debuted in the summer of 1993, initially only in a five-door hatchback configuration. Its familiar name and design profile notwithstanding, the NG 900 was indeed new from stem to stern. 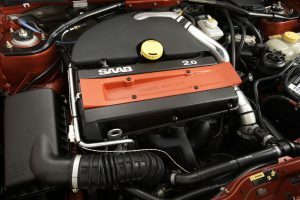 The front-drive powertrain was now transversely mounted, saving space while offering a first in Saab history: a 2.5L V-6 engine, in addition to the tried-and-true, four-cylinder turbo. A unique aircraft-inspired innovation was the “Black Panel,” allowing the driver to shut down all instrument lighting except the speedometer and emergency lights. To prove that all of these changes didn’t diminish the core qualities that dyed-in-the-wool enthusiasts held so dear, Saab accepted a very tall challenge indeed: to race up the steep gravel roads of Pikes Peak, Colo. faster than any car in its class. 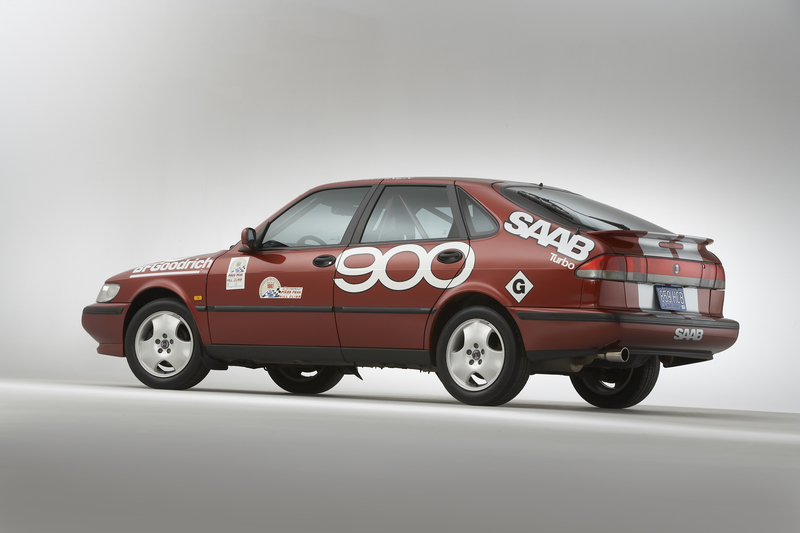 By the time the dust settled, the 1995 three-door, 2.0L Turbo Saab 900 SE made its point. The New Generation was here to stay. The following info Below is from Tom. This car sold at Barett-Jackson Auctions. Once at Barrett Jackson when the car first left the GM Heritage collection in 2009 for $8,470 and then again in January of 2015 for $5,170. It then found its way onto ebay were the asking price was anywhere from $20K to $30K. It was eventually purchased by me in the Summer of 2015. I flew to MotoExotica Inc in St. Louis and drove the car home. Ran perfect and is an absolute blast to drive. I was reluctant to purchase this car at first because of rumors of it not being the actual car that ran the production class event. After calls to John Libbos, former Saab USA exec, and others I decide to take a chance on this car being the correct one. Once it saw it in person I knew it was the real deal. The car has had carbon fiber floor boards added as well as USA style EGT gauge in farenheit and the Turbo Boost gauge in PSI (the rest of the car in European). 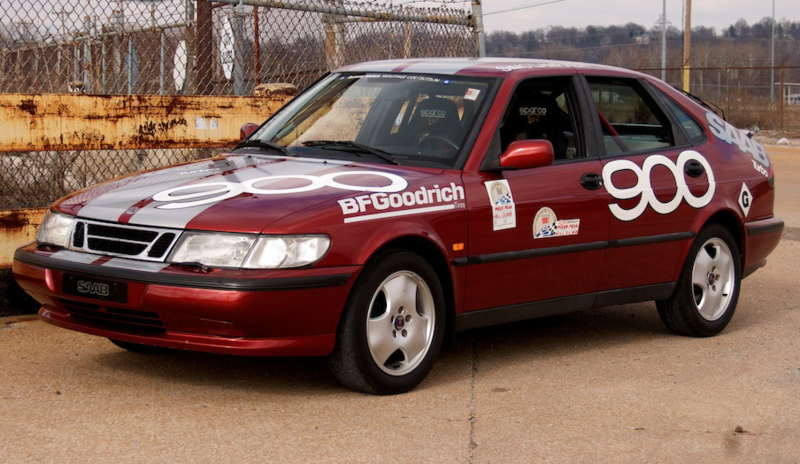 The roll cage and mods for will all confirmed to be done in USA by Jim Smart, fellow Saab enthusiast at SOC15. He knew who did all the work below and confirmed it by telling me to check out the tool kit in the trunk. He said the screw driver will be missing as they borrowed it at a Saab event and it fell into a storm drain. Sure enough, when I returned from SOC15 in Lexington I checked and indeed it is MISSING! Cool stuff. Car driven by Larry Webster, editor of “Car & Driver” magazine. Originally bought to USA for 1996 900 Taladega Challenge but not needed. So car was re-purposed when funds arrived from Sweden for the Pikes Peak Challenge. Car has Close Ratio Opel gear box and was prepped in USA for Event with US gauges and carbon fiber floor inserts. ECU was reprogrammed by Sweden for this event. 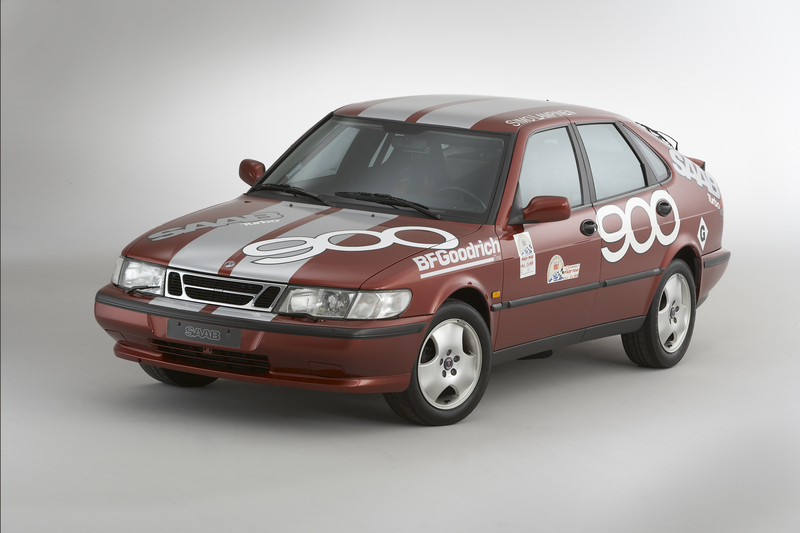 This 1995 Saab 900 Turbo sedan (VIN YS3DC55NXS2049233) is a factory-backed car which was raced at Pikes Peak in 1997, where it recorded a time of 13:46 on way towards a second place finish in the High Performance Showroom Stock class. Fresh from the GM Heritage collection, the car is essentially stock excluding a roll cage and what the seller describes as ten horsepower worth of stickers. Find ithere on eBay in Saint Louis, Missouri with reserve not met. ​Showroom Stock meant just that—the car is completely OEM down to the optional Saab chrome exhaust finisher and funky Saab three spoke wheels. Mileage is listed as 34k (Km) and change, though presumably the car was pretty fresh when first enlisted as a competitor, so it must have been driven quite a bit between retirement and placement in the Heritage Collection. 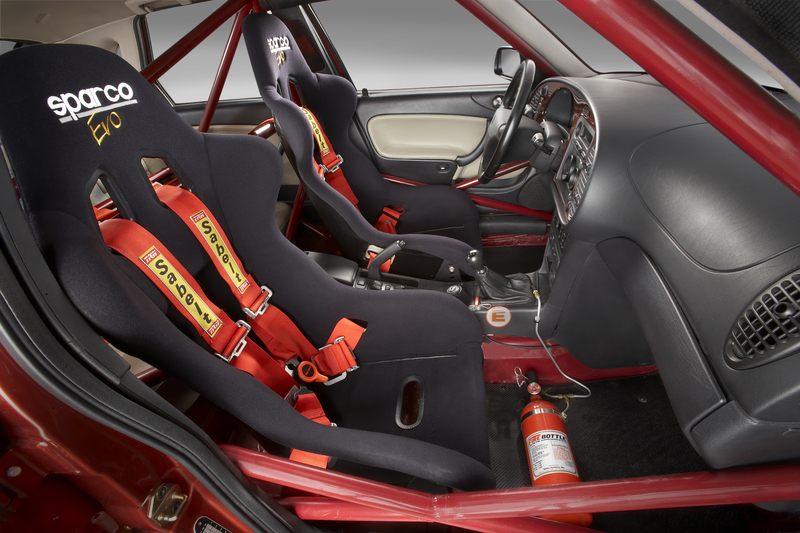 ​Stripped of carpet and running a stout roll cage, Sparco race seats and a fire extinguisher, everything else looks stock including the optional walnut veneered dash, radio and center console-mounted starter switch. Even trunk carpeting, spare and tool kit remain installed. 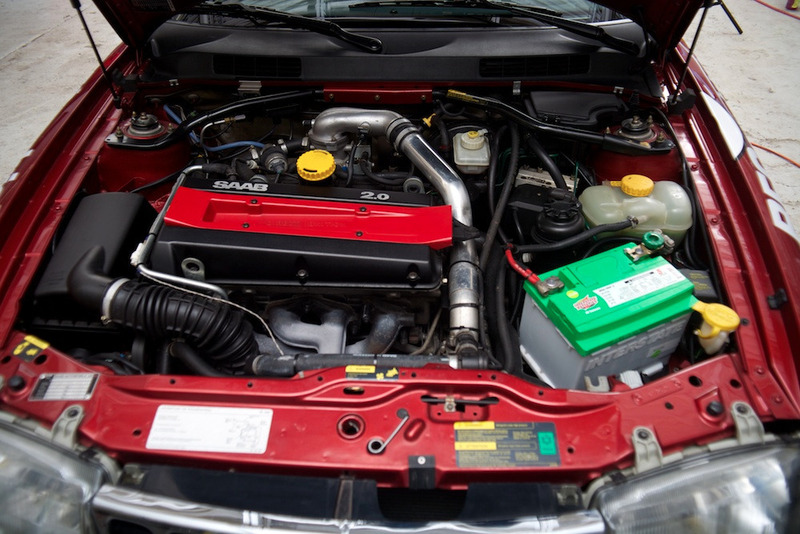 ​Things look completely stock underhood as well, ,and the factory rating on these 2.0L, 16V turbo four cylinders was 182 HP. 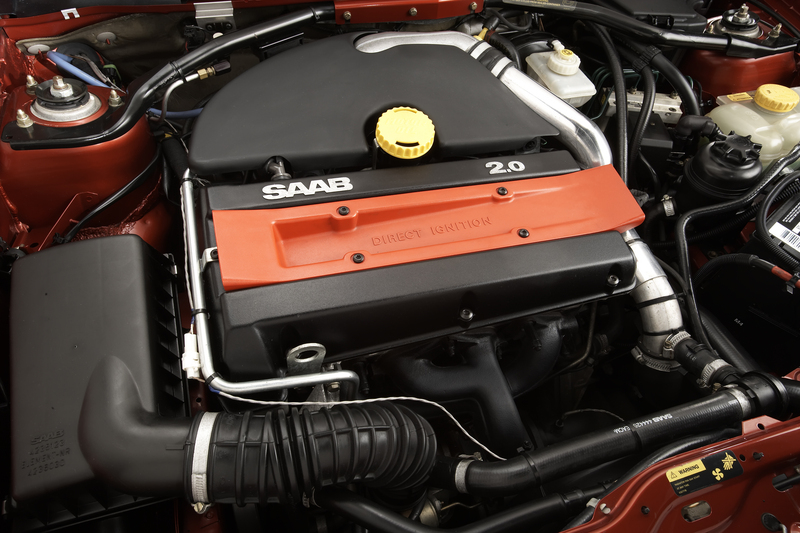 There’s not much else to say here, except to note the convetional transverse engine installation—GM really reigned in Saab’s weirder engineering excesses, meaning no reversed north-south engine placement and chain-driven trans like on the original 900. ​Conceivably, the car could be returned to a family hauler by pulling the cage, throwing in a $300 carpet kit and stripping the stickers off with a heat gun and some razor blades. Still, it’s an interesting slice of Saab history for better or worse, and Pikes Peak is a great event anyway you look at it.